Don and I “escaped” Indianapolis on Saturday, February 28th, just before 7-8 inches of snow fell. We spent a delightful night in Atlanta, GA with Gary & Lisa Lancaster, always great hosts, and arrived in The Villages, FL, our home for the next month, around 3 pm on Sunday, March 1. We have rented a two bedroom villa, as well as a 4-passenger golf cart. And, of course, we brought along the tandem and my new single bike. 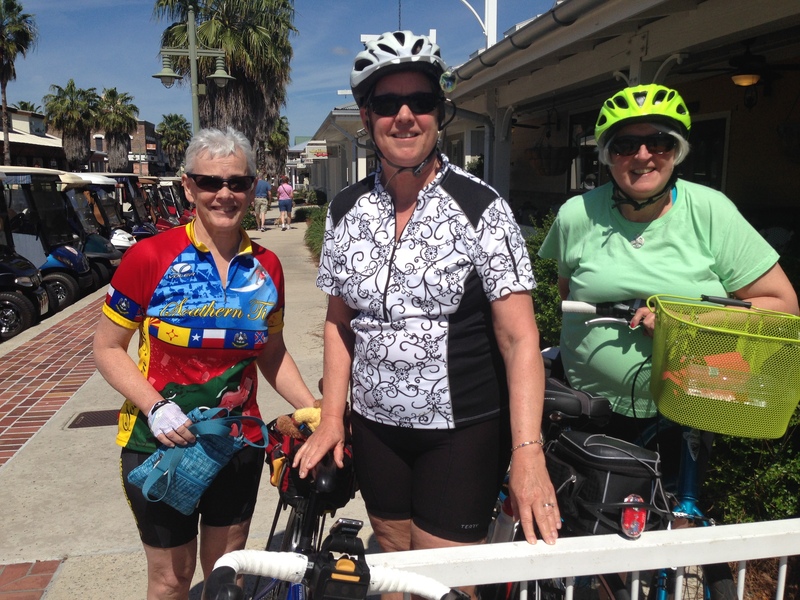 We have quickly adjusted to the “easy life”, riding every day (either on the tandem or on the single) and playing golf (Don) most every day. 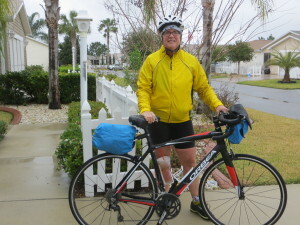 On the two-year anniversary of the start of my cross country ride, I even got caught in the rain, just like my departure from San Diego in 2013. 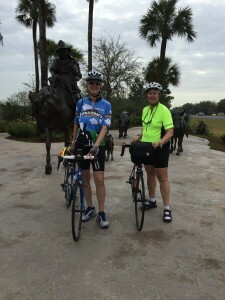 Barbara Kautz from the cross country group is also renting in The Villages and we have connected for breakfast and dinners and short rides, joined for longer rides by Nancy Innes and Leilani Sundt, also from the cross country group, visiting Florida for several days. 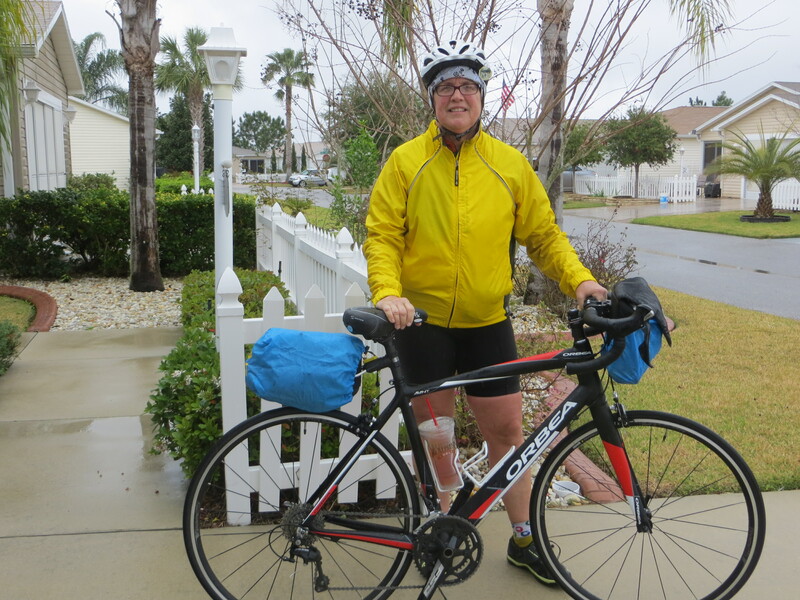 Starting next week, we will be joined by my brother and sister-in-law, then Tim, Molly, Ana and Yoseph, then Sarah, Matt and Mason – excited to see my family before I head out on the Atlantic Coast epic ride. Stay tuned for more details about my upcoming ride! You are boosting my enthusiasm by the day! Dolly, looking forward to keeping up with your ride. When will you be in Maine? We’ll be there May 25 – June 13. Would be great to get a visit in. We enter Maine about June 8th, finish at Bar Harbor on 6/12. I’ll post the itinerary soon. That would be great to see you! And Meredith?? Will you sing for me? ?